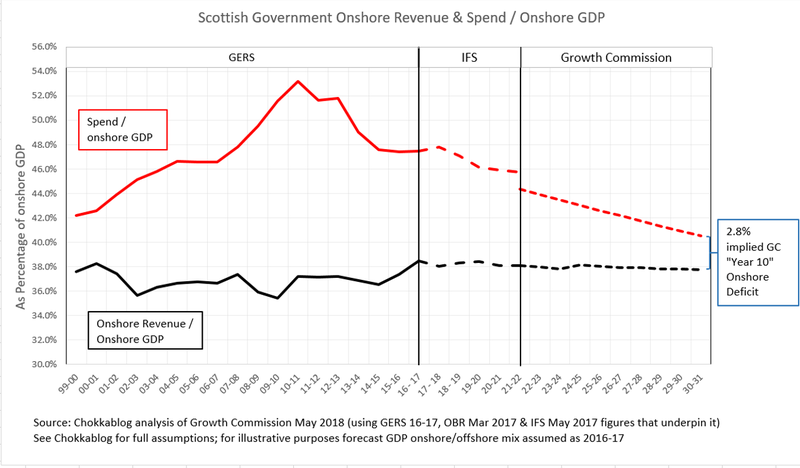 There appears to be be some confusion about the SNP's Sustainable Growth Commission recommendations when it comes to austerity. Let me attempt to quickly clear that up. 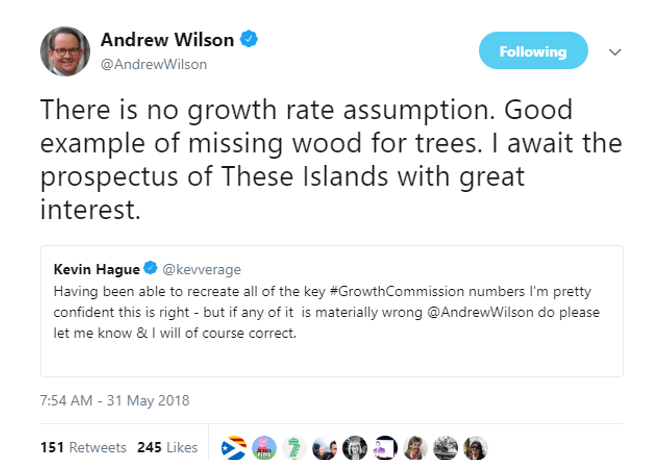 Nicola Sturgeon has taken to Twitter to make clear that the report "explicitly rejects austerity" and "recommends above inflation spending growth each year"
Unfortunately, Sturgeon goes on in that same thread to then assert that the report's "projections about deficit reduction [...] make no assumption about higher growth"
These two statements can't both be true - at least not without making some extremely contorted semantic distinctions between recommendations, projections and assumptions. 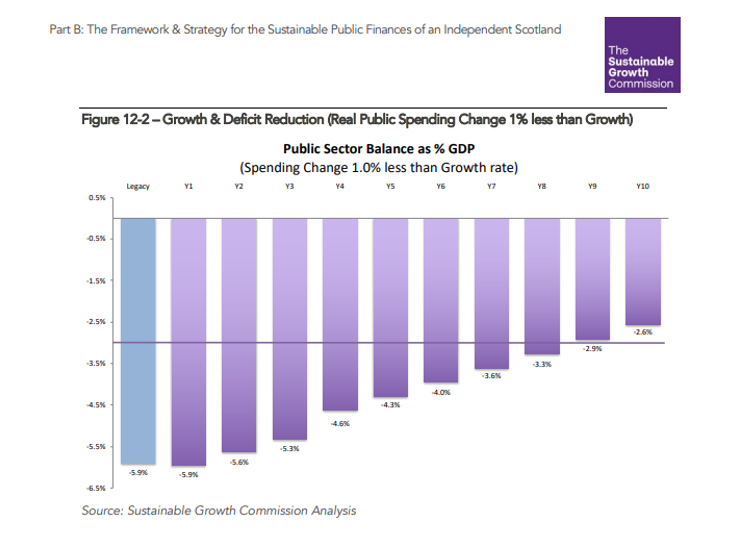 The following quotes are extracted directly from "Part B: The Framework & Strategy for the Sustainable Public Finances of an Independent Scotland"
That section of the report is making assumptions about growth to be able to make a projection about deficit reduction that could be achieved while accepting the recommendation of modest real terms increases in public sector expenditure. Here's the problem: while all that's required to draw this graph is an assumption that spending growth will lag GDP growth by 1.0% (hence "would also have the same effect [..] at different levels of growth"), for that to translate into the recommended "modest real terms increases in public sector expenditure" we obviously have to assume real GDP growth of over 1.0%. 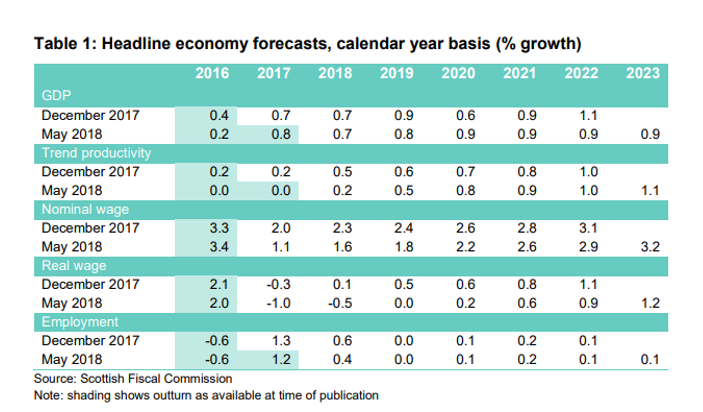 At the risk of labouring the point: to get the deficit down at this rate the report assumes that [Real Spend Growth] = [Real GDP Growth - 1.0%], a number that can only be positive if Real GDP Growth is more than 1.0%. That's why in B12.18 the report assumes a real GDP growth rate of 1.5%, because spend growth at 1.0% less than that would still lead to "modest real terms" spending increase of 0.5% pa. The second statement above can only be consistent with the first statement if we assume real GDP Growth of c.1.5% pa or greater (as the report does for its illustration in Fig 12-2). But, when I asked him for any comments on my previous blog on this topic (Growth Commission: Embracing Austerity), the report's Chairman Andrew Wilson was very clear:"There is no growth rate assumption"
Let's be clear: you can't say the report "recommends above inflation spending growth each year" (Sturgeon's words) or "recommend modest real terms increases in public sector expenditure" (the report's words) while also recommending "public spending growth limited to significantly less than GDP growth [..] to reduce the deficit to below 3% within 5 to 10 years" (the report's words) without making a growth rate assumption - or at the very least, without making a minimum real growth rate assumption. So I'm sorry, but to assert that "there is no growth assumption" at the same time as making claims that the report "rejects the austerity model" while recommending to "reduced the deficit to below 3% within 5 to 10 years" is, at best, carelessly inconsistent. At worst, it's a cynical attempt to mislead. Let's finish by returning to the illustration the report uses to show how they assume we could get the deficit down to 3% of GDP within 10 years. As discussed here, to create this illustration the report makes no assumptions about economic disruption caused by separation from the UK, makes heroically optimistic assumptions about cost savings we'd achieve to calculate our "legacy deficit" starting point and brushes over the practical challenges and implications of their sterlingisation recommendation - but let's park all of that and look only at what "Spending Change at 1.0% less than Growth Rate" would look like in the context of our actual historical spending levels and GDP growth rates. So there we have it. 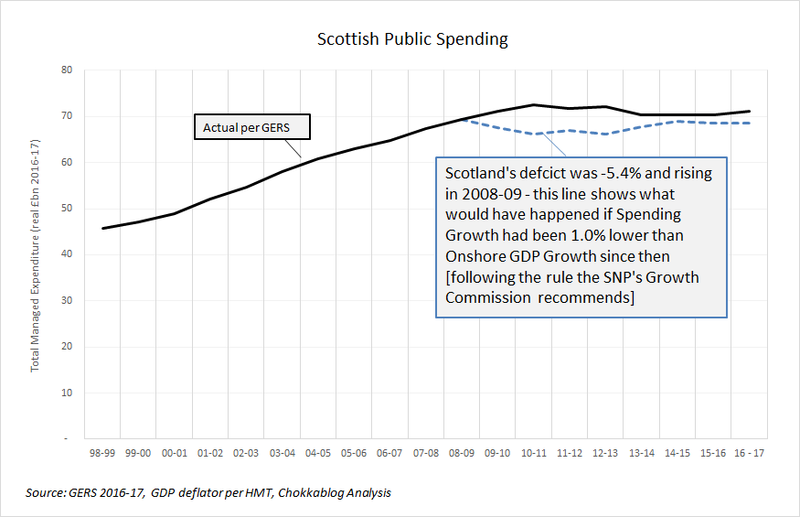 If applied in the recent past, the assumption the Growth Commission uses to illustrate how we could achieve their recommendation of getting from their "legacy deficit" to a deficit of under 3% of GDP within 10 years ... would have produced dramatically lower levels of public spending for Scotland than "Westminster austerity" has actually delivered. 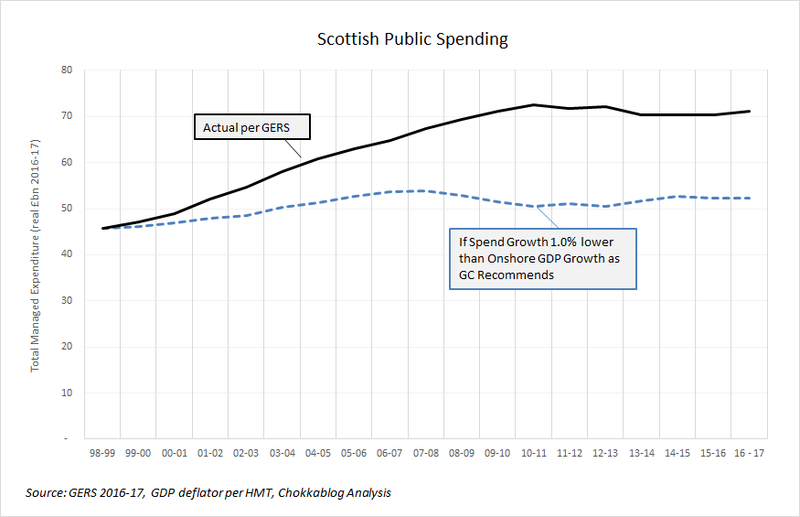 If applied historically, the Growth Commission's spending growth recommendation would have led to greater spending austerity than that we've experienced under the "Westminster austerity model" the Commission "explicitly rejects". Of course if you assume higher GDP growth then that would change this picture - but as the Report's Chairman makes clear: "There is no growth rate assumption"
On this basis, to achieve the deficit reduction at the pace the Growth Commission assumes in its illustration, we would have to be cutting real terms public spending by 0.1% pa (presumably by more than that on a per capita basis). Austerity for the long-run then. I enjoy reading your blog because of the logic and rigour you apply to your writing. So vastly different to the principles used by your academics, media and politicians. 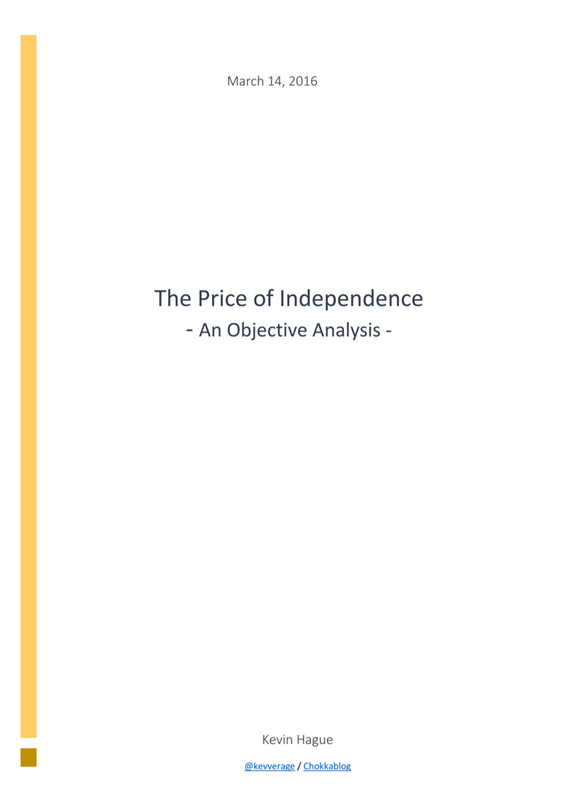 We have a useful tool to gauge the viability of Scottish independence. Is the aim truly independence or something on which that label can be hung? Theresa May’s Brexit will be the most expensive and ineffectual membership of the EU. Sturgeon’s only hope is that she negotiates with TM and successfully manages to use Sterling, have the BoE underwrite any Scottish deficit and guarantee to cover it and to carry on receiving funding from England. Fortunately, with TM, anything is possible.